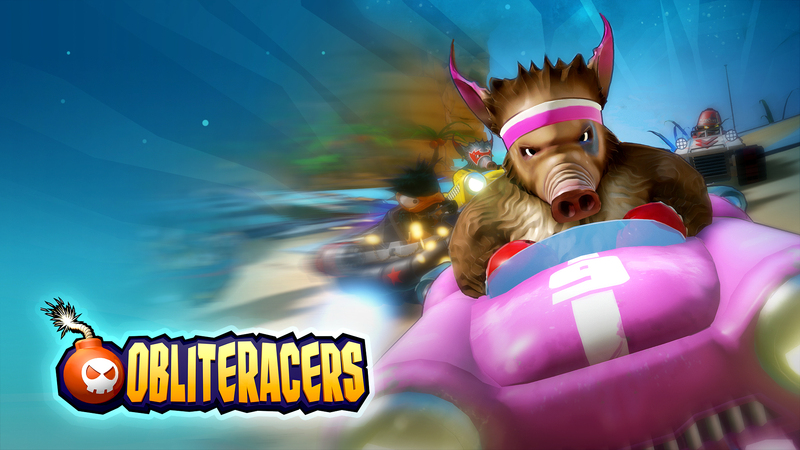 Home / Obliterating racers in Obliteracers! Having played older kart-based racing games like Mario Kart, Crash Team Racing, and Wacky Wheels, Obliteracers fits right in with the genre. 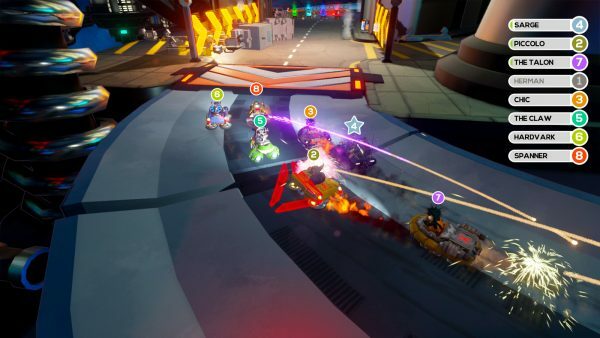 Developed by Space Dust Studios, Obliteracers is a neat little kart racer, that with it’s art style, is most evocative of the Ratchet and Clank universe. 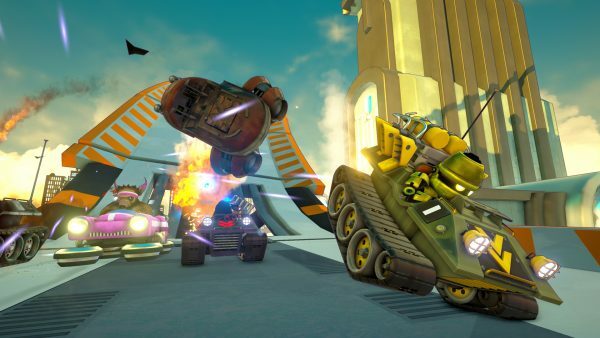 Though, not without its faults, Obliteracers is a fun game, and is a good addition to the genre. The game’s premise, at it’s very core, is to win. Expounding on this, the player does this by eliminating other racers. Some races involve getting the most eliminations, others are won by surviving, and some are simple races. Even in death, you can still affect the race outcome! Taking a note from other kart racing games, surviving and winning can be done with the help of various powerups though the various maps. From the standard missile launcher, to the electric shocker, and trip mine bombs, races can get quite hectic. In addition to powerups, karts have the ability to absorb powerups to recover health, which is key to surviving matches. Adding fuel to the fire is the fact that any powerup used is fair game to affect anyone in the match. So that means if the player sets some mines, it can lead to an accidental crash and burn for the same player. Fortunately, even if your racer does crash and burn, it doesn’t necessarily mean the end. There’s a neat little game mechanic that kicks in for certain game modes after death that allows the player to lock on racers and fire tracer missiles. Tracer missiles can be an immense help in knocking out higher-placed racers. Knocking them out eliminates the chance for them to score any more points in a round of gameplay. Once I figured out how to do this in the earlier part of the career mode, my quest to beat Obliteracers became much easier. The career mode is very expansive, starting off with the tutorial level, and expanding from there. Placing first though third in races will award up to a three bomb ranking, which determines if a player can advance to the next level or not in career. The career mode is long enough to provide a nice challenge but not end up feeling like a grindy slog. This is a tough balance to strike but Obliteracers has done it well. While I was still learning how to do things in the earlier career missions, I had my first 8-player match and it was hectic. The first few races with 8 players, I had quite a bit of a difficult time keeping track of my racer. After some practice I was able to keep track of my racer. My advice to new players is: it got easier, just keep going. That said, it can still be difficult to keep track of all what’s going on in races due to all the mayhem going on. The game is supposed to be hectic, intense, and full of mayhem, and it does it quite well. This is not a bad thing, as the mayhem makes the game feel fast, fresh, and intense. When matches do get very hectic, and it happens often, it is hard to keep track of things. This can lead to frustration. Possibly adding to the frustration is another game design choice the game camera. The game camera focuses on the lead racer, which can cause trouble for some racers. Karts that are way behind can disappear from the screen for that aforementioned reason. Once the kart is left behind, it’s an instant death. I found in a few places the camera was extra punishing. A couple of times that I got slightly stuck on some of the race scenery, I was unable to catch up soon enough to do any good. The camera is designed to be like it is, but it has been a small source of frustration for me while playing though some of the races. The races themselves are a good mix of short and sweet, and longer more intense races that drag on longer. With some of the higher point requirements of some of the career matches, it gets a tad repetitive. More than once I found myself wondering how much longer will it would be until the race is ended. This repetition extends a bit into online as well, unfortunately. Overall, I think this game is designed for playing with other people, and that shows through in some of the frustrations that I felt in career mode. Without the friendly trash talking, or playing with friends, races get dull and don’t hold the same excitement for me as they would otherwise. It’s still a fun game to play, but it’s better suited for playing in bursts for these reasons. As mentioned earlier, the game’s art style looks like it could easily fit in with the Ratchet and Clank series. From the racer designs, to carts, and race track designs, the game looks great. While races can get cramped when there’s eight or more players, I never felt too crowded. The race tracks don’t usually obstruct the field of view for the camera, and when they do its only for a brief moment. The sound and music quality is quite on par with the rest of the game. They both fit in, but the music is a bit forgettable, unfortunately. I would have liked something a bit more hectic to go with my mayhem. I also found the controls for this game to feel a bit stiff. I think this may have added to my frustration a few times when I got stuck on scenery. Aside from stiff directional control, kart response to jumping, and using weapons is pretty solid. Overall, this is a fun game to play. While Obliteracers doesn’t have the grab and keep playing quality of a Diddy Kong Racing or a Mario Cart with out other players. It is good to play in bursts. The career mode has quite a bit of content to clear though, and that adds a bit to replayability. Playing though with friends is a must in order to get some intense and fun matches out of Obliteracers. Even with it’s bit of issues, it’s still an enjoyable game. This is definitely a game to get if you’re a fan of kart racing games. In addition to that, this game gives an opportunity for console owners to see what kart racing games are like, as games of this genre is a bit scarce for the PS4 and Xbox One. Obliteracers is now out for PS4 and Steam, and is coming soon for Xbox One.